"Lollipop is like an extension of our household to our children and their teachers are like an extended family. We feel that our children are safe and loved at Lollipop. Everyone knows them by name and is willing to help them with whatever their needs may be." 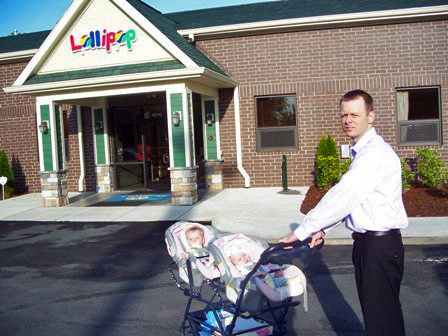 "My husband and I knew there was something special about Lollipop from the moment we first walked through the doors. We were impressed with the welcoming and friendly faces as well as the clean environment, and that has continued since our son started a year ago. Colten is so important to us, and as such, we feel very comfortable and confident that he receives loving and attentive care from the dedicated teachers and staff at Lollipop. Our experience has been great. We could not ask for a better place to entrust the care of our first child. Lollipop has been a true blessing to our family!" "Lollipop offers Elizabeth a home away from home. Her teachers make learning fun and are able to give one on one attention even in a classroom environment. Elizabeth loves Lollipop so much that on the weekends we play school and we have play the roles of her teachers. It gives me a feeling of comfort to know that she is in such a warm and caring environment when I cannot be with her." My girls entered the nursery at 8 months old, and Ms. Bonita claimed them as “her babies.” She does this with all the children who enter her door. I’m sure somewhere there are 6’4” grown men who are still Ms. Bonita’s babies. She is a font of wisdom I could always turn for reassurance that I was doing just fine with my little girls. Ms. Bonita was their beginning at Lollipop, and I couldn’t ask for a better one. I could write of every one of my daughters’ teachers with glowing terms. I won’t single any teacher out for special treatment because every one of them has been a wonderful stepping stone to their progress. 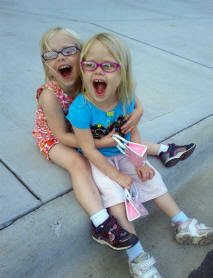 They have all adored my daughters from the minute they stepped into each classroom. Teachers have worked with us on solid foods, toilet training, behavior challenges, and physical difficulties. My daughters were walking delayed, and their teacher was more than happy to have their physical therapist come in to show the best way she could help the girls not just improve, but succeed. Often, their father and I will ask each other which one of them taught the other something, and the answer has often been: must be school. My ex-husband and I are on the way to divorce, but we maintained with Lollipop for more than just their schooling. I consider it a stable part of their lives and an important part of their emotional wellbeing. My daughters are well adjusted in part because Lollipop is such an amazing facility. Activities at Lollipop are varied and in a word, fun. They run and play on their age appropriate playgrounds, drive around on bike day, and enjoy splash day when the summer heats up. However, there are additional activities they can attend, provided by third party individuals but held at Lollipop. My daughters in particular play soccer and go to Shake, Shout, Shimmy, a dance/movement class. These cost extra but have been well worth our money. Academically, I must mention the Learning to Read program, a program that is free of charge, for ages 8 weeks old to 4 years of age. Each week each student receives a book bag with different books in it to take home to read with parents. We were provided support to read and encourage our children to become readers through DVDs and workshops. It’s a wonderful program, and we really enjoyed being a part of it. My daughters also participate weekly in learning rudimentary Spanish. It’s amazing, and I often have to ask their teachers for translation since I myself do not know the language. At their age they are little sponges, and Lollipop is providing a lot of intellectual water for them to soak up. My daughters amaze me daily in their ability to reason, write (one of my daughters is writing her name already), sing songs, and explain the science from how things grow to what plaque can do to your teeth. These discussions are rooted in the time they spend in their classrooms. They often talk about what they have learned in class. Along with academics my daughters have learned good manners, how to handle different conflict situations with fellow students, and how to sit and listen well. Quite honestly, every time my girls leave a classroom and move onto another I am sad they are leaving and wish they didn’t have to leave. Once I have met the new teacher, however, I am excited about their new possibilities. Outside of their wonderful teachers, I must also talk about two other individuals. The first is Ms. Kellie, front desk, fill in, Jack-of-all-trades, and wonderful support for parents. She is always smiling and happy when I come in. She sits and has long discussions with my daughter when my daughter does nebulizer treatments. She is priceless when it comes to her organization skills, often reminding me when medication needs to be filled or forms to be completed. More importantly, to me at least, Ms. Kellie treats children like the little people they are. My girls adore her. Finally, there is Ms. Barbara, the director. I don’t have words for what she means to me. I will try to give you an impression. First of all, she loves children. She reminds me of a favorite aunt. I have often gone to her with developmental questions and she will pull some report or article out for me to read and reference. She is constantly trying to better Lollipop. Her office door has photos of every child on it. She really loves them and often pops into classrooms to check on teachers, but also to join in the fun. Personally, Ms. Barbara has become my friend, and is always my number one fan when it comes to my accomplishments professionally, personally, and with my daughters. We feel blessed to have such a wonderful facility, such wonderful teachers and amazing experiences to enrich our children and help them to be the best people they can be."